ARCH COREPISCOPO Most Rev. 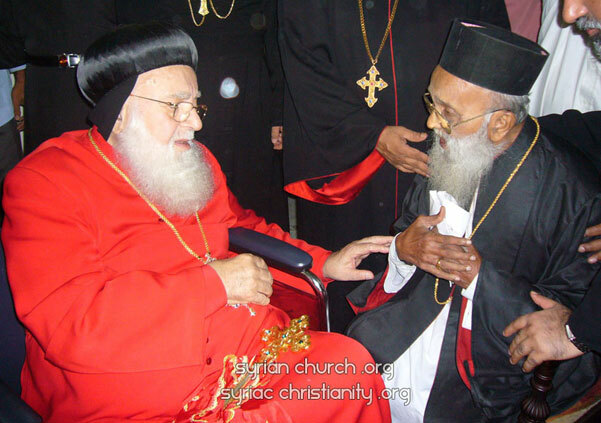 (Dr.) Curien Kaniamparambil, who passed away (103 years) on 19th October 2015, was a living legend with his academic contributions in multifarious domains of the Jacobite Syrian Orthodox Church, and with spiritual gems being expounded from the depth of his heart. He is one of the very few living authorities of Syriac, ‘the language of Our Lord’, in the world today. He is the Bright lamp of the Universal Syrian Church, Cynosure of the Churches of Syriac heritage, Beloved son of the Patriarchs, the Catholicose's and the prelates, Friend and guide to the clergy and laity, Loving and devoted husband, affectionate father and grand & great grand father. He is becoming a living saint or has already attained that stature. 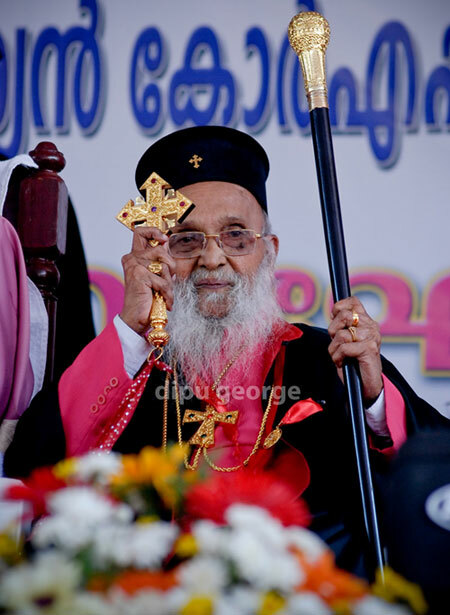 He is the pillar of Jacobite Syrian Christians of Malankara (India) for the past 70 years. A majority of the living Syrian Christians have their spiritual needs satisfied through him. Hence he is the spiritual godfather of many in this land. The greatest achievement of his life is considered to be the translation of the complete Holy Bible, from ancient Pshitho Syriac text to Malayalam for the first time, which was released on August 2, 1994. Our Most revered Ressh Corepiscopo is God’s gift to India, particularly to the Syrian Orthodox Church and to all the lovers of Syriac heritage. His literary works has built up a lasting legacy to all those who want to familiarize themselves with the study of Syriac language, history of Syriac Churches and the biblical traditions of the Churches of Syriac heritage. The Syriac scholars and the Heads of Syriac Churches have shown a great appreciation for his literary services and achievements. 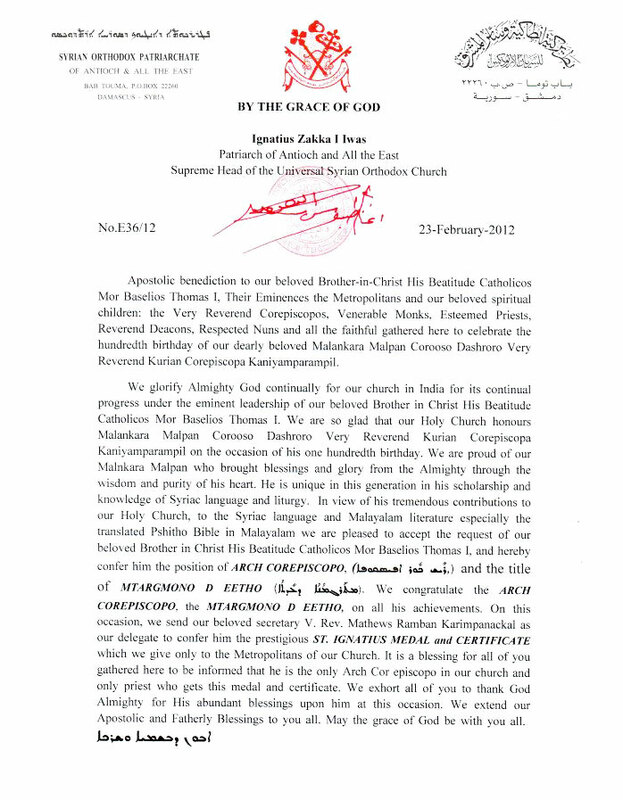 In recognition to the tremendous contribution to the Holy Church, to the Syriac language and the Malayalam literature, especially considering the first complete translation of the Pshitho Bible in Malayalam, the Patriarch of the Apostolic See of Antioch & All the East and the Supreme head of the Universal Syriac Orthodox Church, H.H. Ignatius Zakka-I Iwas, elevated the esteemed priest to the position of REESH EPISCOPO (ARCH EPISCOPO), at a grand function held at the Syrian Church headquarters of India at Puthencuriz, Kochi on Saturday 25th February 2012. His Holiness also conferred the title MTARGMONO D EETHO and awarded the ST. IGNATIUS MEDAL and CERTIFICATE to the Very Rev. Curien Kaniamparambil. On the occasion, the Church presented the Reesh Episcopo with a STAFF & CROSIER, permitted to be used only by the Metropolitans of the Holy Church. 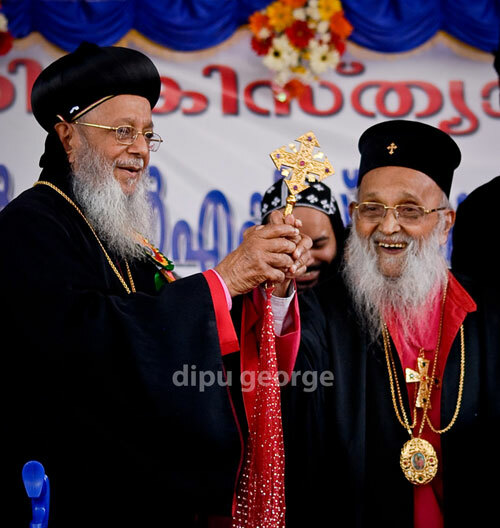 The Catholicos and the primate of the Syriac Christian Church in India, His Beatitude Aboon Mor Baselios Thomas-I, presented all these decorations and awards to Most Reverend Curien Kaniamparambil, on behalf of His Holiness the Patriarch in the presence of the Malankara Synod secretary Mor Gregorios Joseph, Metropolitans, clergy and dignified guests. In the long history of the Holy Syrian Church, this is the first time a married priest is elevated to the position of ARCH COREPISCOPO, thereby recognizing his incomparable contributions in the last 100 years. His earlier education was in the schools at Kanjiramattom and Mulanthuruthy. After completing the seventh standard, he learned the basics of Jacobite liturgy, Syriac and theology at the feet of Very Rev. Augen Ramban at Sion Kodanad, only for a few months and the knowledge he accumulated was gift of God in answer to his prayers and efforts. At the tender age of 15 he translated the Sunday morning Prayers from Syriac to Malayalam, in poem, the first of its kind, which is said even today, in the Jacobite and Orthodox Churches throughout the world. He completed his college education from C.M.S College, Kottayam. In 1931, he married Saramma (Ammini) from the Kattumangat Kattappallil family of Mulanthuruthy. Around this period he published a book on Syriac grammar. Following year, he was ordained Kassiso by Malankara Metropolitan H.E. 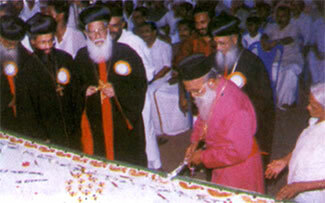 Paulose Mor Athanasius (Valiya Thirumeni of Aluva). During the apostolic visit of Patriarch St. Ignatius Elias III to Malankara, Kaniamparambil Achen served H.H as his secretary for a brief period. Three years later he was appointed vicar of Kattaprath Church, Thiruvalla where he continued for 24 years. In 1959 he was appointed as the vicar of St. George Simhasana Church, Thiruvalla. He served as the chief vicar of the St. George Church till 2006 when he was shifted his residence to his home town at Kanjiramattom in Ernakulam district. In 1950, at the age of 37, he was raised to the rank of COREPISCOPUS, the highest order the Church bestows on a married Kassisso, by the then Apostolic Delegate of the Patriarch H.E. Mor Julius Elias Metropolitan. He also received many Titles and Medals from Moran Mor Aphrem I, Moran Mor Yakoob III, and Moran Mor Zakka I Iywas, Holy Patriarchs of Antioch and all the East. In recognition to his great scholarship in Syriac, theology, liturgy and Church history, Very Rev. 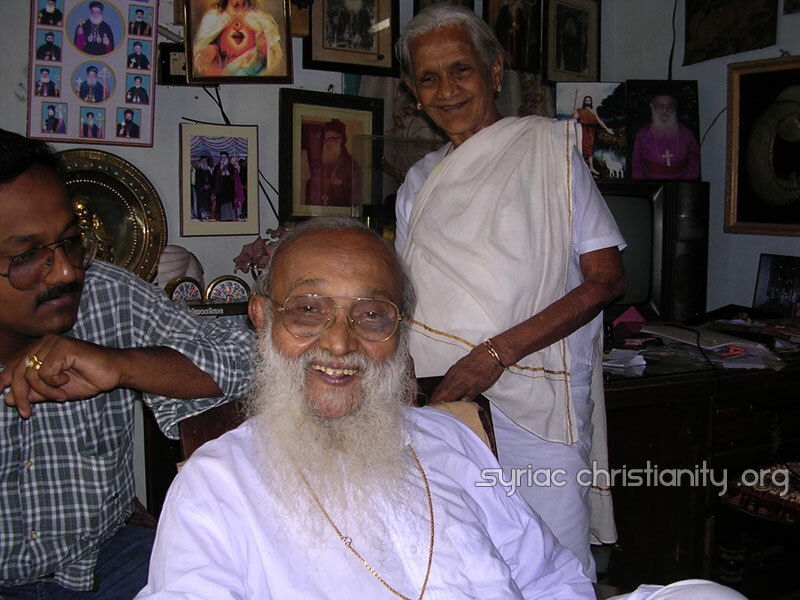 Curien Corepiscopa Kaniamparambil was granted the most prestigious title of 'MALANKARA MALPAN' (Doctor of Malankara Church) by the late Patriarch of Antioch and all the East Moran Mor Ignatius Yakoob III in 1978. He, thus succeeded the former Priest Trustee of the Jacobite Syrian Church, Very Rev. Mathen Corepiscopa Konatt (d. 1927), who is considered as the greatest of the 20th century Syriac scholars in the Malankara Church. Kaniamparambil Achen is one of the two persons who is decorated with this title of Malankara Malpan, outside the famous Konatt family. In 1982 H.H. 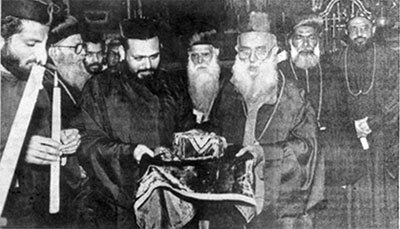 the Patriarch Moran Mor Ignatius Zakka I conferred on our beloved Achen the unique title of ‘Korooso Dasroro’ (Proclaimer of the Faith). Impressed by the simplicity of Kaniamparambil Achen, late lamented Catholicos of the East Aboon Mor Baselios Paulose II awarded him the title ‘Nathaniel’ (Israelite without guile). Kaniamparambil Achen also received the Degree of Doctor of Divinity (Honoris Causa) in 1979, conferred on him by the St. Ephrem Institute, Solna, Sweden. Very Rev. Curien Corepiscopo had been the founder Secretary of the All-Travancore Syriac Association, All Malankara Cleric Association and the Syrian Church Revival Movement and served as the Director-General of the Malankara Syrian Sunday School Association for 30 years, of which 15 years when the two churches remained united in Malankara. He was also the editor of many of the Church periodicals, ‘The Syrian Leaflets’, ‘The Syrian Church’, ‘Malankara Sabha Mitram’, ‘Syrian Sandesam’ and ‘Antiochean Sandesam’. He served as member, Board of studies in Syriac, in the Kerala and Mahatma Gandhi Universities, continually for 40 years. The Rev. Reesh Corepiscopo has served for 18 years, from 1977 to 1994, as Priest Trustee of the Malankara Jacobite Syrian Orthodox Church. In 1997, he was once again unanimously chosen as the Priest-trustee, which he is continuing even now after the formation of a new Association in 2002 for the Jacobite Syrian Christian Church. He served as Delegate to the World Council of Christian Education Assembly held at Lima, Peru, in 1971 and visited most of the Syrian Orthodox parishes in the U.S.A and has visited Syria and Gulf countries many times. He is indeed the living legend of Syriac in Malankara and also in the world to a large extent as we all know. Many of the bishops of our sister churches had their Syriac education under him. Many more had approached him to clear doubts regarding theology. He had handled many columns in the leading theological magazines regarding the faith and the Christian beliefs. His stewardship benefits thousands presently in different walks of life. He is a gifted Orator. We are really blessed by his words, which flow from his ocean of knowledge, with the relevant meaning and implicative feelings. He is instrumental for the help to many in their spiritual enlightening. He always honoured Sunday as the day which God had created for His worship and blessings to man. So exclaims-“Oh Man! If you are not ready to accept the “free of cost” blessings from God-Alas! Pity You”. These types of penetrating thought provoking and mind throbbing words have really changed lots of people. He kept five slogans as part of life style and repeated as his anthem of life. He loves all. The greatest quality of him is his “oneness with others”. He has never separated from anybody-either a man of ninety or a child of 1 or 2. He is a friend of all. His sound qualities like transparent behavior, commitment, ardent love and belief to spirituality, humility, soberness etc. always kept him above all. He is an ardent believer and is an avid adorer of Mother Mary. He keeps her to his chest any time and every time. He proclaims “Virgin Mary’s prayers and blessings keep him agile and motivated for many things in life, in spite of the worldly deafness which he consider to be the greatest gift of God”. St. George Simhasana Church premises on 27th February 2002. Margonino (Syriac novel), Subhashithanagal etc. Apart from all these, his poems ‘The Miracles of Our Lord’ in English, specially written for youngsters with practical hints for true Christian life, have received wide acclaim. So far he has published more than 51 books in Syriac, Malayalam and English and 4 more are in press. Now he is engaged in the Syriac-English Dictionary and 151 Speeches along with the history of the Holy Church. (The manuscript of the dictionary was released on 15th February 2003 at Mor Ignatius Church, Manjanikkara, on the occasion of the 71st Dhukrono of Patriarch St.Elias III). May the Lord bless his Servant who spends his life for Syriac and for unraveling the treasures of the Syriac Fathers to the benefit of the sons and daughters of the Syriac Churches here in India and of all the lovers of the Syriac language. May the almighty shower His blessings over our Valiyachen to be active for the world’s enlightenment through his Gospel Mission. The biography of Very. Rev. Curien Corepiscopa Kaniamparambil published here is compiled from 'VISION', the periodical of the Outside Kerala diocese of the Malankara Syrian Orthodox Church, written by by Dr. A M George [Mumbai], Dr. Nelson P Abraham [Elanjimoottil, Thiruvalla] and Sr.Hatune Dogan [the Syrian Orthodox Nun from Paderborn, Germany, born in Zaz, Tur-Abdin]. 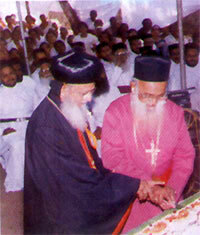 Catholicos Aboon Mor Baselios Paulose-II (middle) of blessed memory. Apostolic benediction to our beloved spiritual son Malankara Malpan Korooso Dasroro Very Rev. Dr. Curien Corepiscopa D.D. Kaniamparambil, Tiruvalla, Kerala, India. It is with great pleasure we received your letter dt. August 7, 1993, informing us about the accomplishment of your venture translating the Peshito version of the Syriac Holy Bible to Malayalam language. we also received a letter from His Beatitude Mor Baselios Paulose II, Catholicos of the East, intimating us about the decision of the Holy Episcopal Synod in India sanctioning its publication. We hereby approve the decision of the Holy Synod and permit you to publish your translation of the Bible. We thank God for giving you health and intellect even at your old-age for this herculean task. The work you have done is comparable to that of St.Jerome who translated the Holy Bible to Latin. We are sure that your name shall go into the annals of the history of our Malankara Church for this commendable work. We hope this work of your's will be a great help for the Biblical students and the Malayalam speaking people to study and understand the Bible in its real meaning. We congratulate you and wish all success to your venture. We extend our Apostolic Blessings to you. 1979 Degree of Doctor of Divinity (Honoris Causa) was conferred on him by the St.Ephrem Institute, Solna, Sweden. during the World Syriac Conference held here. 1997 Again Priest Trustee – presently continuing. For 30years, he was the Director of Malankara Jacobite Syrian Sunday School, of which 15 years was when the two churches remained united in Malankara. He was member, Board of studies of Syriac in the Kerala and Mahatma Gandhi Universities in Kerala for many decades. 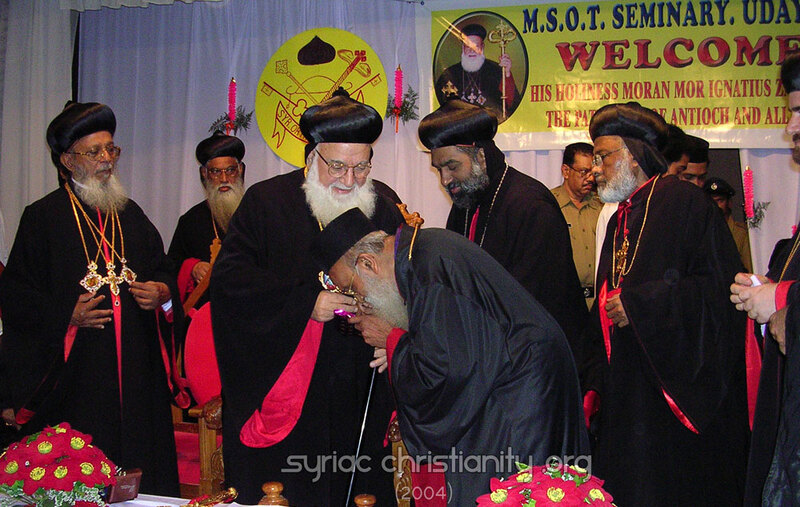 He is the brave commander of the Jacobite Syrian Christians in Thiruvalla and the southern diocese of the Church for seven decades. Singing the sweet melodies of the Lord in tounges different. The halo of the "Tongues of Fire' encircling him. And chosen to pass the Lord's words round the globe. Yet the flowing beard, 'white as snow' held high.